Presa Canario hails from the Canary Islands it is a molosser dog medium size, well balanced, of straight profile, with a black mask. Rustic and well proportioned. It is mesomorphic; the body is longer than the height to the withers. Females accentuate this characteristic being slightly longer. Expression is confident, noble and a little distant. 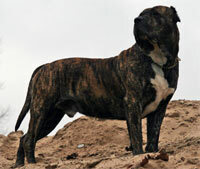 The role the mystical dogs of the Canary Islands played in the development of the Presa Canario is largely unknown, various historical documents show that the Guanche civilization may have trained their dogs for hunting and for war. Presa Canario is a result of crosses between the “majorero”, a pre-Hispanic cattle dog originating from the islands, and molosser dogs brought to the archipelago. The breed is specifically described as “dog of guard.” This means a defensive posture. The breed is very versatile and should be neither outwardly vicious or excessively shy, Presa Canario is first and foremost, a working breed, traditionally used for the handling and driving of cattle. The breed has a loyalty to family that is extraordinary. Presa Canario will do okay in apartment if it is sufficiently exercised. They are relatively inactive indoors and will do best with at least an average-sized yard.